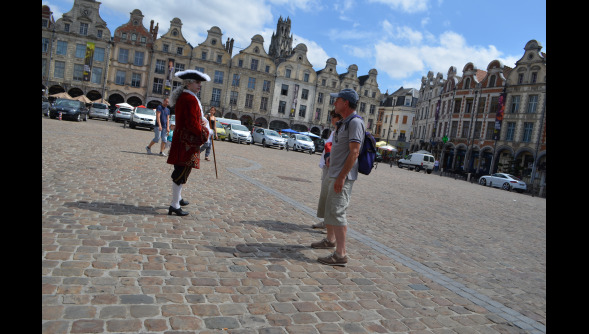 The Arras which Robespierre knew in the 1780s was a bustling provincial capital. 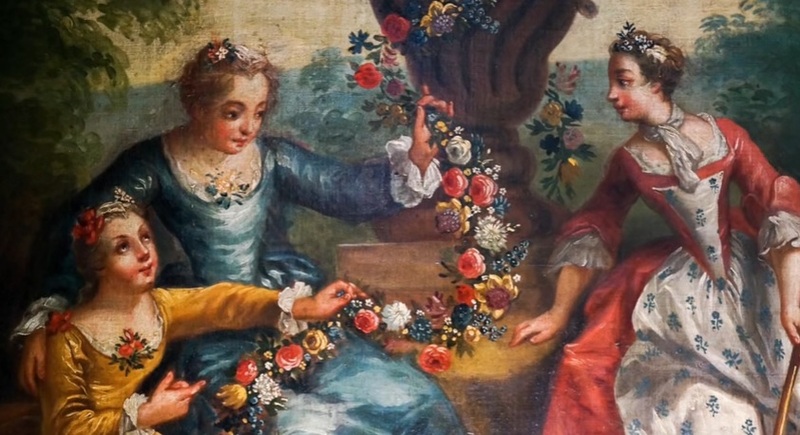 Following annexation to the French crown in 1652 the Artois had flourished, with a thriving textile trade and one of the biggest grain markets in the country. In the years after 1730 the clergy and nobility of Arras, with their vast rural estates, benefitted from a boom in grain production and an accompanying rise in land prices. The town was still on a relatively small scale, with population of just over 20,000 and, within the confines of its medieval ramparts, could be traversed in fifteen minutes. Nonetheless, it was already divided into distinct districts: well-to-do central parishes; the crowded streets of the poor along the River Scarpe and its tributary the Crinchon, the military "citadelle" and the "town" which housed a plethora of lawcourts and administrative buildings. This beautiful maquette by the engineer Ladevèze in 1716 was constructed as part of Vauban's plan for the defence of the north-east frontier. It is constructed of wood, cardboard paper and silk, to a scale of 1/600. 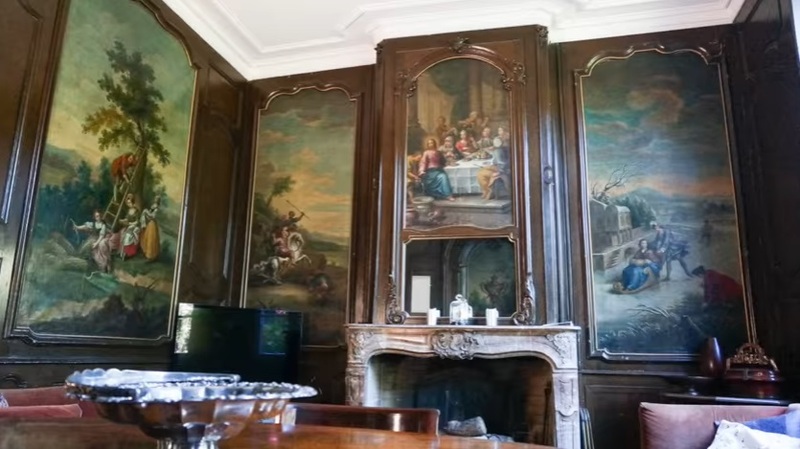 It was bought by the town of Arras from the collection in Les Invalides in 1904 and has been patiently studied and restored by M.Honoré Bernard over a thirty-year period. The model shows clearly the cathedral, the central city around the abbey of Saint-Vaaste, the squares, the belfry, the crowded mass of houses, and the many churches and religious houses of the town, almost all of which were already destroyed in the Revolution. Adam Frans Van der Meulen, Arras Cathedral in the late 17th-century. 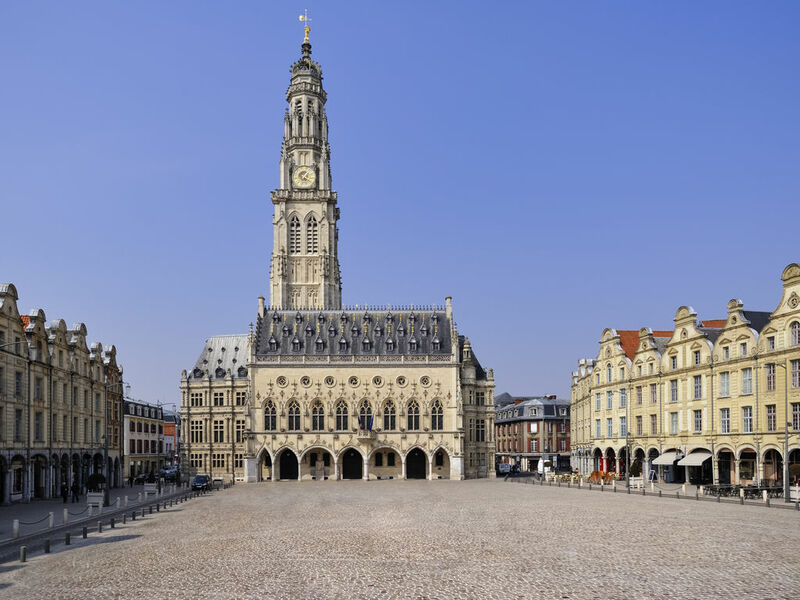 Arras was above all an ecclesiastical centre, a "city of a hundred steeples" dominating its flat hinterland. 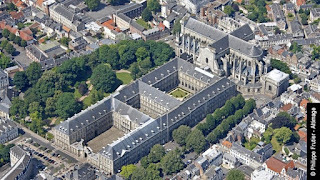 Foundations included the great Benedictine Abbey of Saint-Vaast, the cathedral, twelve parish churches, eighteen monasteries and convents, plus a myriad of smaller chapels and houses. There were as many as eight hundred clergy in all. The Bishop of Arras, Monseigneur de Conzié, was one of the best-remunerated prelates of the kingdom; the cathedral chapter alone had thirty-nine canons, forty-four chapelains and eleven curates, and an annual income of 150,000 livres from rents, tithes and dues. 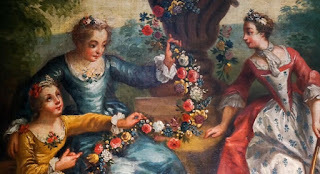 (McPhee, Robespierre, p.2-3) Many of the shopkeepers and craftsmen were directly or indirectly dependent upon them - Robespierre's relative on his mother's side, depicted by Dominique Doncre, is referred to as "Carraut, brewer of the l'abbaye de Saint-Vaast." 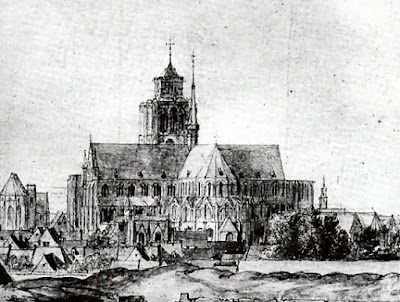 In Robespierre's day, the Abbey, which had stood for generations, was reduced to a "vast building site", entirely demolished and in the process of being rebuilt following collapse of the belfry in 1742. 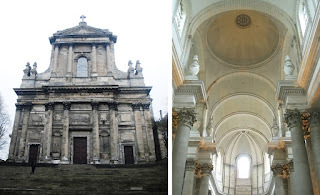 The Abbey church, the present-day cathedral, was begun in 1778 in neo-classical style by Contant d'Ivry, the architect of the Madeleine in Paris. Almost all the churches of Arras were destroyed during the Revolution. 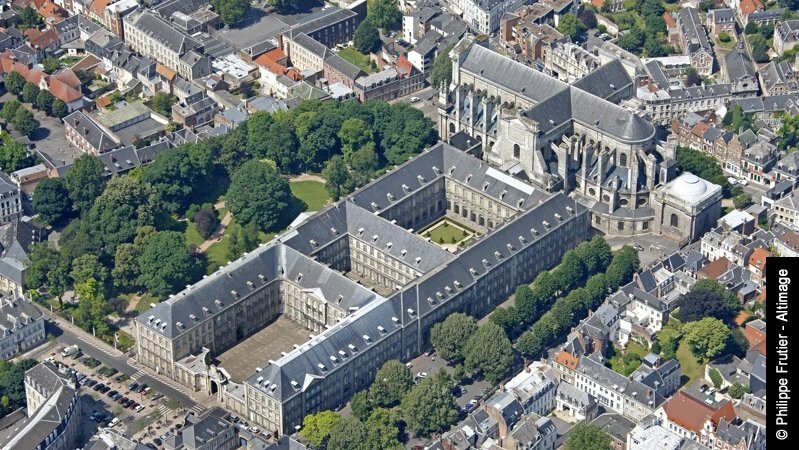 St-Nicolas-des-Fossés alone survived, transformed into a Temple of Reason - renamed St-Jean-Baptiste, it served as Arras cathedral until 1833. The present church, however, dates only from the 1920s. The entrance to the Abbey in the place de la Madeleine Lithograph by Charles Desavary, 1877. In Arras the military, royal and provincial administrations of the Artois converged. The great citadel to the southeast of the town made the army a constant presence; the garrison held up to 5,000 men and many more were billeted in the town. 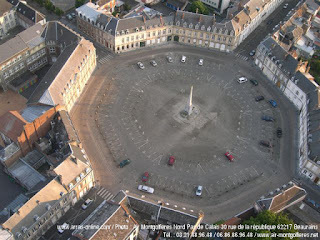 The military hierarchy was closely integrated into Arras society : it may be observed that one of the two witnesses at Jacqueline Robespierre's burial was Antoine-Henry Galhant, lieutenant-major of the garrison (McPhee, p.9). 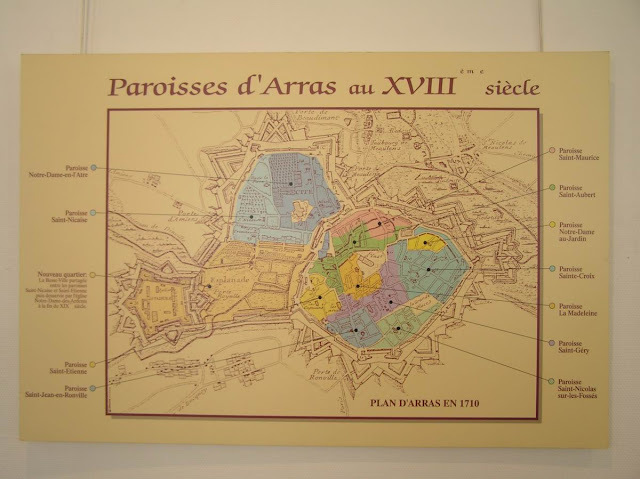 In addition, Arras was the seat of the provincial Estates of Artois, an aristocratic body which met annually under the presidency of the Bishop. The Palais des États also housed the Arras Royal Academy of Belles-Lettres. The site, in the Place des États d'Artois, is now occupied by the High Court (Tribunal de Grande Instance). 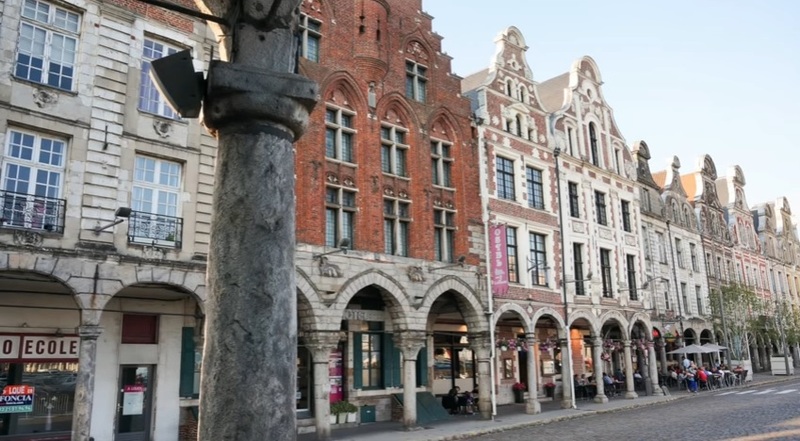 The complexity of local administration was reflected in Arras's interwoven complex of legal jurisdictions; there were no less than four ordinary and five Royal courts serviced by a professional body of 85 lawyers. (Paris, Jeunesse de Robespierre, p.30-31). The supreme court, the Conseil d'Artois, was located in the rue de la Gouvernance, off the place de la Madeleine, in a site now occupied by the Collège Saint-Joseph. 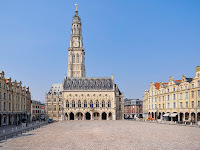 In 1722 Maximilien de Robespierre, grandfather of the revolutionary, moved to Arras to become a lawyer in the Conseil d'Artois. He enjoyed income from property and settled in the prosperous parish of Saint-Aubert. (McPhee, p. 3). He was to be followed in due course by his son François and in 1781 by his grandson and namesake. Arras in the 18th century was a place of busy construction, both public and private. In the thirty years before Robespierre's birth, 1,500 permits for building or rebuilding were issued in the town (McPhee, p.8). The great central squares had already taken on their 18th-century appearance. 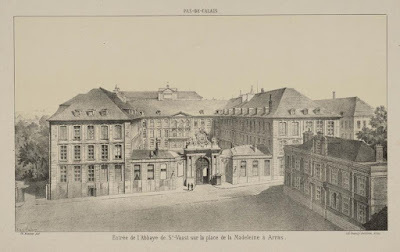 An ordinance of 1692 required new owners on both squares to match the facades of their gabled homes to those of the newly completed Maison de l'Ecu d'Or (now destroyed). A further ordinance of 1718 stipulated that all rebuilt facades be identical "brick for brick or stone for stone". The surrounding area was home to the elegant townhouses of a wealthy landed elite, mostly drawn from the fifty noble families of Artois. 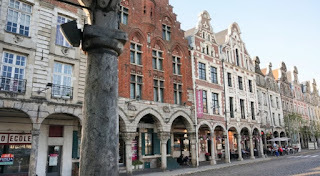 A dozen or more grand hôtels are recorded in the district of known as the petit-Saint-Germain, bounded by the modern rues Gambetta, Pasteur and Emile-Legrelle. 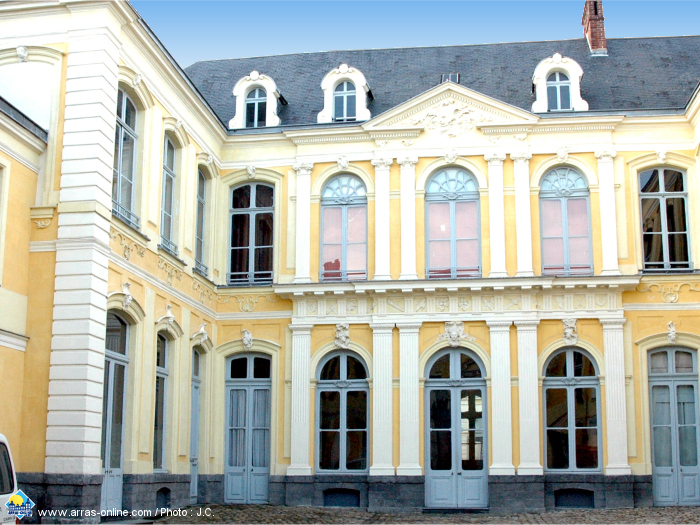 The best surviving examples are the hôtel Dubois de Fosseux in the rue du Marché-au-Filé and the hôtel de Guînes, rue des Jongleurs, formerly the residence of the First President of the Conseil d'Artois, now a cultural centre. 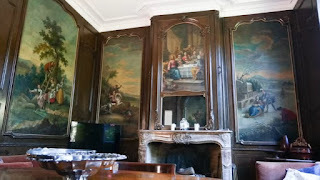 Also of note is the Corne d'Or guesthouse, just round the corner from the Grand-Place, which boasts an intact set of 18th-century wallpaintings. Outside the medieval walls, in the marshy ground in front of the citadel the municipality was developing a whole new quarter, the Basse-Ville, with wide tree-lined avenues and an imposing octagonal central square; at time of Augustin's birth the Robespierre family lived in the rue des Jésuites (rue du Collège) in parish of St Etienne on the edge of the new district.